A total of 58 local candidates recently cleared the final hurdle to become fully-fledged Chartered Accountants (CA), having equipped themselves in corporate governance, business ethics and the application of international accounting and auditing standards. This significantly exceeds the 51 who passed in 2016 with 24 of the 58 successful candidates having obtained their undergraduate degrees at the University of Namibia or Namibia University of Science and Technology. Sixty four candidates took the exam and 58 were successful (90% pass). With a pass rate of 89% for these candidates, local universities proved that they can produce graduates that succeed in their post-graduate studies and professional examinations. The President of the Institute of Chartered Accountants of Namibia (ICAN), Talita Horn, announced that the 58 successful candidates passed the Assessment of Professional Competence (APC) on 22 November 2017 – a full day examination implemented as a real-life simulation case study reflecting the demands of the modern business world. “This arduous and challenging path of qualifying, consisting of three parts, firstly formal university education up to a post graduate level, secondly, a training contract of at least three years of professional competency-based training and thirdly a 12-month professional programme course and two sets of profession Institute exams, requires talent, diligence and commitment. In the ever-changing global and regional business environments, there are still people that perceive accountants to be the traditional bean counters. But this is not true, the role of CAs has changed dramatically to meet the demands of the modern business world,” Horn said. Horn added that the 2017 APC highlights ICAN efforts to continue ensuring its qualifying process reflects the development of relevant competencies which a Namibian charted accounted needs to have in the workplace. Baronise Hans, Lionel Mathews and Junius Mungunda, the respective Managing Directors of Bank Windhoek, Nedbank and Standard Bank are also members of ICAN. 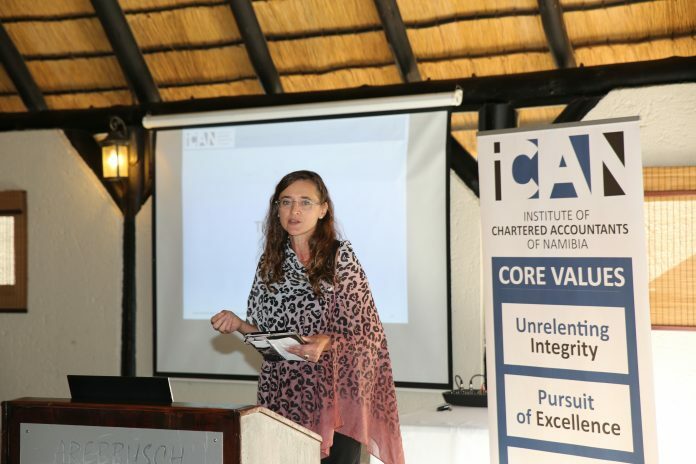 Caption: President of the Institute of Chartered Accountants of Namibia (ICAN), Talita Horn.